The last two years have been a blast. I’ve created countless custom trading cards for my collection. I’ve cut up a game used bat and even went to my favorite player’s house (Jose Canseco) to have him try on several jerseys, just so I could cut them up and make my own “player-worn” custom cards (don’t worry, they weren’t his old A’s gamers). It’s a question I get literally every week. It is so difficult to answer, because I use all kinds of different tools, depending upon the project. With so many requests for custom cards, I had an idea. 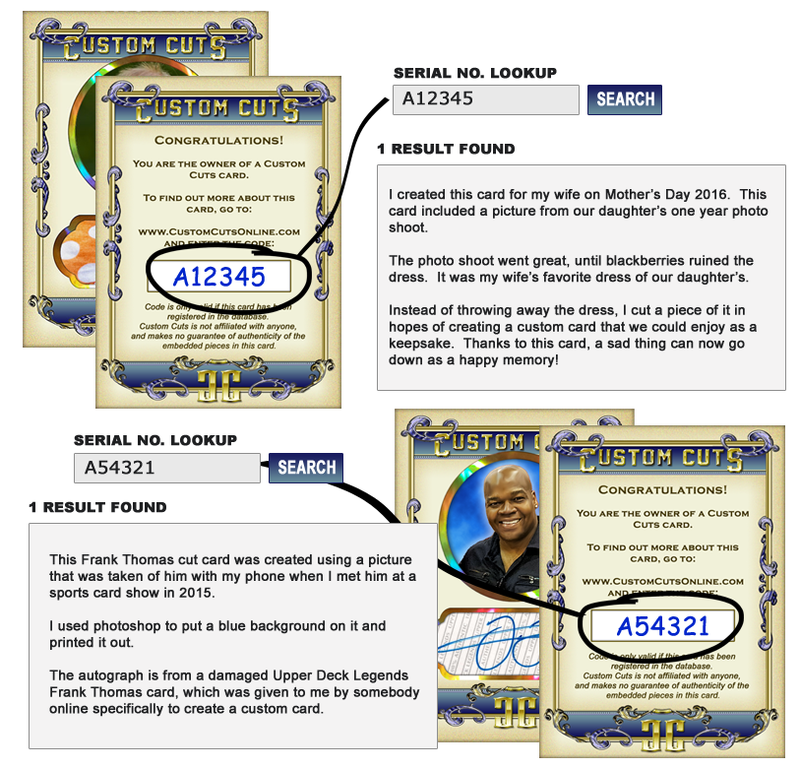 What if there were a way to allow people to easily create their own custom cards without any technical or artistic know-how? There is clearly a lot of interest, so why not? 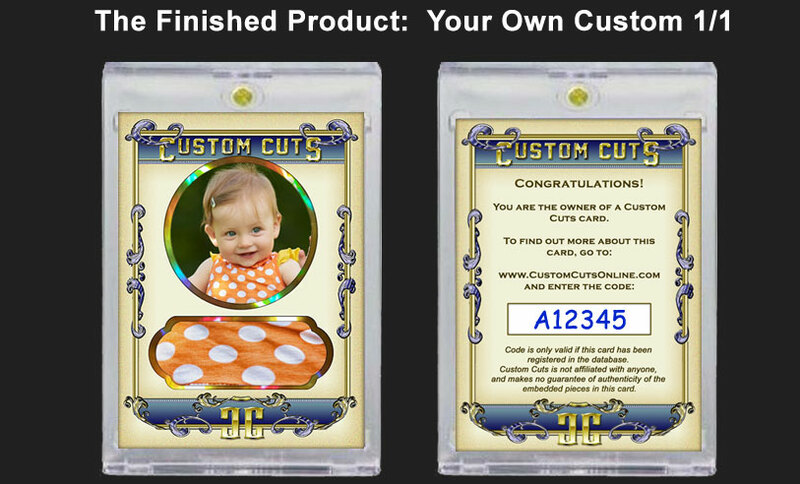 After much trial and error, I came up with Custom Cuts, which provides an actual card creation kit designed to make it both fun and easy to use to create your own “1/1” trading card. What collectors choose to make is up to them. It can be a card of a favorite player or something a little more personal. 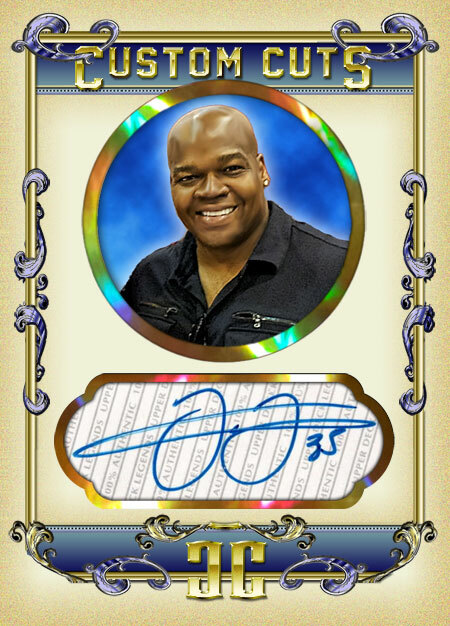 While the obvious application is to create something new using otherwise meaningless swatches of material, damaged or cheap autographs and pictures, the image above demonstrates how you are limited only to your imagination (I think Allen & Ginter is to thank for it being okay to make cards of our pet cats). 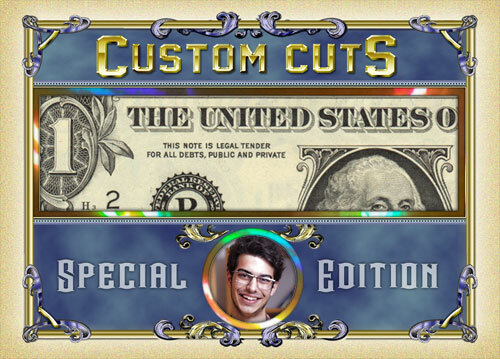 Here is a quick run down of how a Custom Cuts card is put together. The back is actually like a sticker. Once you are ready, you just peel it and stick it to the back! Total invested time? About five minutes. 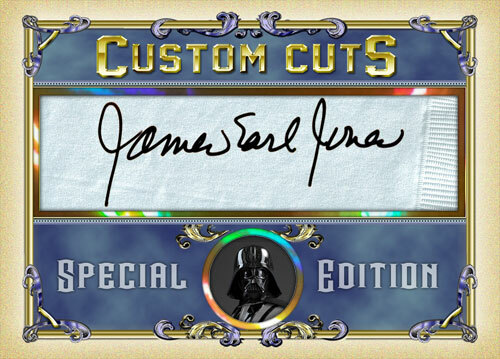 If you own an item that has a clean autograph but is damaged in some other way, creating your own cut and signature card is a fun way to preserve it and have something you can actually show off. Needless to say, I’m excited. 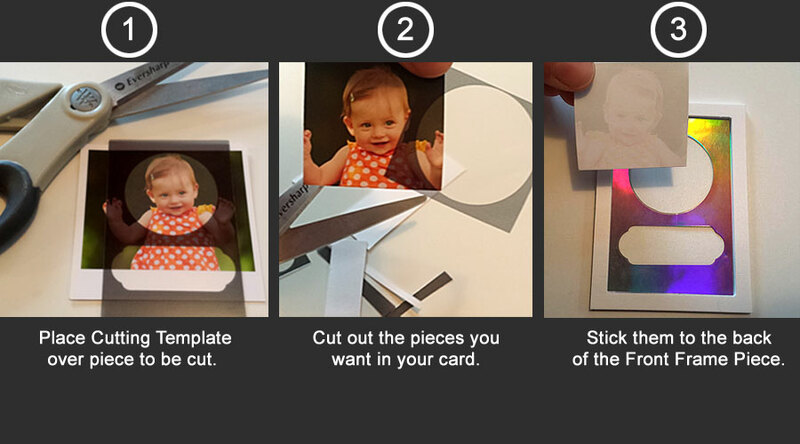 I’m excited about how easy it is for anyone to put their own cards together. I’m excited about how fun the process is to create a card with a friend or family member and I’m really excited about seeing what you can put together using your own cards, memorabilia and autographs. 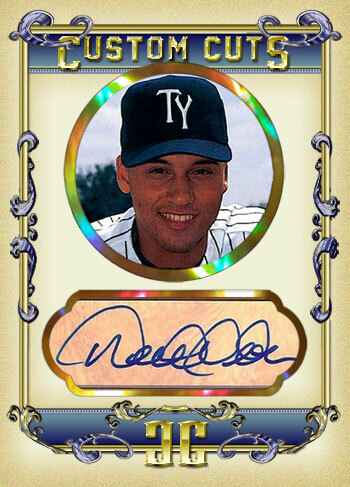 A Derek Jeter using a minor league trading card back for the picture and an autograph on a program from when you saw him at a basketball game years ago. A card with your first dollar bill that you made in business. 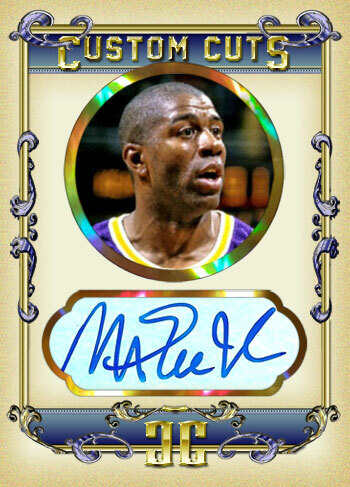 A Magic Johnson card using a damaged autographed card and a picture cut out from a magazine. 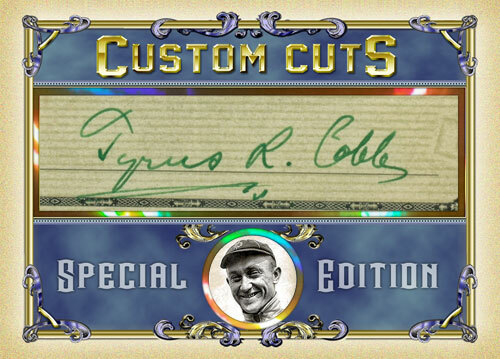 A Ty Cobb card utilizing a photograph and a cut signature. 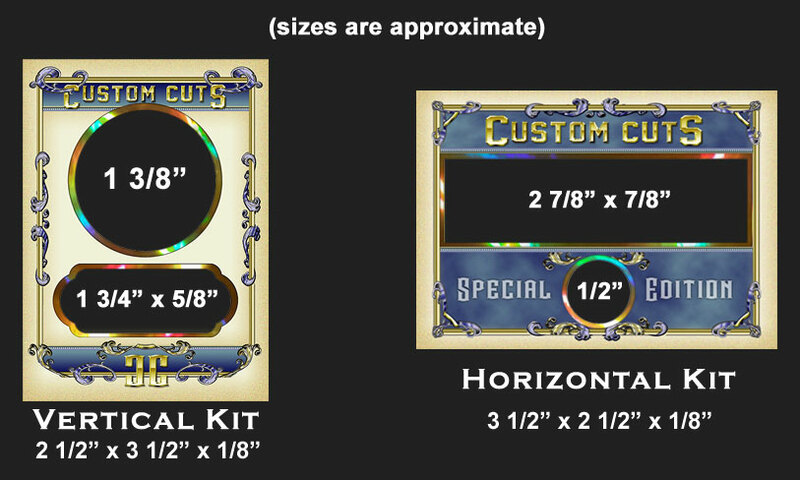 The kits are sold on the website for $29.99 or the entire card can be created for you with your materials for $49.99.